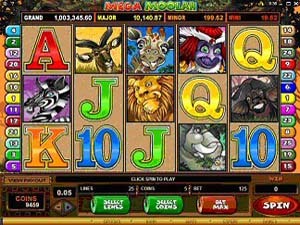 Mega Moolah has been growing in popularity ever since it came online and is rapidly establishing itself as a must play progressive slot. The free spin feature is unique in that when a player catches it during play, they are awarded 15 free spins. If you enjoyed the movie Lion King you will probably like this slot game. A player should root for the Lion to show, as it is a wild logo. Rating for this slot progressive is a 9 out of 10. The African graphics are interesting to view and the play can result in a substantial windfall if the jackpot comes up on a single spin. Millionaires Club Slot is a long time favorite and was the source of one of the largest jackpots in online history with a win by a blacksmith of over 8 million dollars. A feature of this slot is a minimum jackpot of $175,000 and due to its notoriety the progressive amount increases weekly at an amazing pace. When playing online this slot is always worth a few spins by any player. Rating for this slot is a solid 8 out of 10. Others have more interesting graphics but you cannot leave this one out of any list of great slots due to its amazing progressive growth each month. 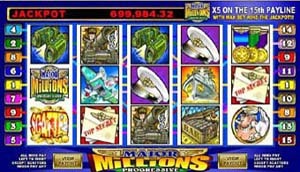 Major Millions is another progressive slot that is fun to play, with a jackpot that seems to always be growing. If the Major Millions symbol completes a winning line, the payout is tripled. The coin size is limited to a 20-cent coin so the total bet on any spin is very modest. The rating for this progressive slot is 7 out of 10, but it is a solid pick for play due to the size of the jackpot. Three Major Millions symbols on the third enabled payline will capture the progressive jackpot. Modest cost per spin makes this progressive slot available to all players. One of the newest online casino games to make its presence known in the online casino world. The biggest reason for this selection is it is fun to play, with many decisions to make that can have financial consequences. The rating at this time is 7 out of 10 only because it has not been tested for a long enough period. This rating will go up as more people discover this newest hybrid slot/video game. Take out a contract and play to see if you can become one of the worldâ€™s premier Hit Men. With a base jackpot of $20,000 and a $40,000 jackpot in the free spin mode makes this game a great potential winner. KingCashALot has been around for some time, but both new players and old time online gamers still play it. The rating is 7 out of 10 only due to the fact that some of the newer video games are more attractive to play. 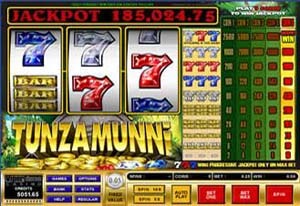 The jackpots on this game can be substantial if you have played the maximum coins on all lines. Five King symbols on the ninth line will capture the Jackpot. The bonus game is triggered if three dragons show up between lines 2, 3 and 4. This is an old timer, but it still merits a few plays when online. Comic book fans will remember this super hero of old. Now you can revisit the past and win some money. The jackpot will pay 12,500 times the wager if the player has played the maximum per line. As a Marvel associated slot game this casino online game will allow for the random showing of one of Marvels three jackpots. 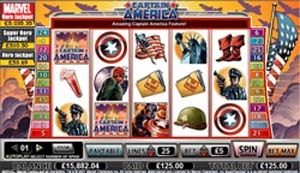 Older players who remember the Captain America comics can wax nostalgic and also try to win some money while playing the online casino slot. The rating at this time is a 7 out of 10, but will certainly climb as more players discover this online hero again. TV fans will remember the Osbournes family from the sit-com that was on the TV for some years. A player can get even more of this TV family by playing the new Osbourne video slot. At this time the rating is 7 out of 10 due to the newness of the game. 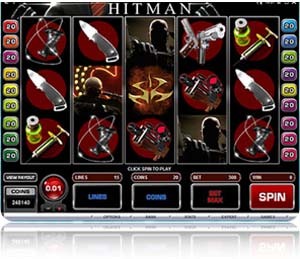 The video game has some nice features such as free spins and 2 bonus games that can show up. 10 free spins are awarded if three Mini logos show on any of the reels at the same time. A winner on the free spin is doubled. 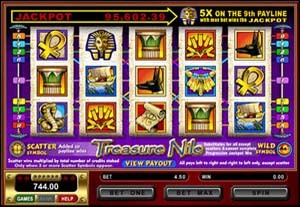 A fan of Egypt will love the graphics of this video slot game and also the jackpot if they are lucky enough to capture this prize. 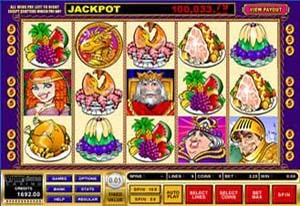 This progressive jackpot is activated when the player plays nine coins. There are wild symbols and scatters that will help a player to the reward from one line. 7 out of 10 is a fair rating for this older progressive slot, although it does garner some interest with the Egypt themed design. Nine Pharaohs on the ninth pay line will win you the progressive jackpot. The minimum jackpot is $40,000 and is the automatic reset if a bigger jackpot is hit. This is an every-player game as the maximum bet is only 25 cents per spin and there is only one payline. The rating is lower than the rest as the jackpot is not the greatest, but the low minimum makes this game available to all players. The rating for this online slot is 6 out of 10. The old time slot feel is present for those that remember the triple 7s paylines. In Tunzamunni the symbols are sevens of red, white and blue. If the payline comes up with one of each, the jackpot will be paid as long as the maximum bet was made. Any amount lower than 25 cents will be paid at a multiple of 2500 times per coin.